Raju’s captors layered tighter chains on him and attempted to confuse him by shouting commands, but their efforts proved futile. A team of 10 veterinarians and experts from Wildlife SOS along with 20 Forestry Commission officers and two policemen managed to rescue the abused elephant. For 50 years, Raju the elephant was abused, held shackled in spiked chains and forced to live off scraps from passing tourists. All that changed when he was rescued last weekend by wildlife conservationists who said the animal cried when he was finally set free. Wildlife SOS, a group established in 1995 to protect endangered wildlife in India, set out to rescue Raju on the night of July 2. Raju is around 50 years old and was likely captured as a baby and bought and sold many times over the course of his life. 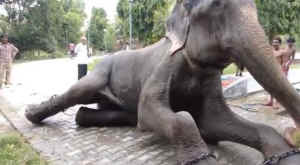 He was forced to work as a begging elephant in Allahabad. His legs were bound in spiked chains that made walking difficult and left him with chronic wounds. He was also beaten. Wildlife SOS found out about Raju’s story through India’s Forestry Commission. 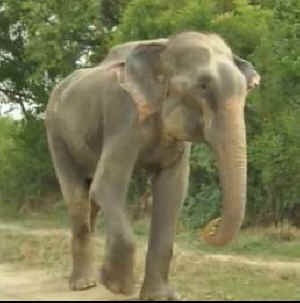 When the group attempted to rescue Raju on the night of July 2 in the Uttar Pradesh region of India, his owner and mahout — an individual who rides elephants — apparently attempted to dismantle the effort with a standoff, Nikki Sharp, the executive director of Wildlife SOS-USA, told The Huffington Post Monday. 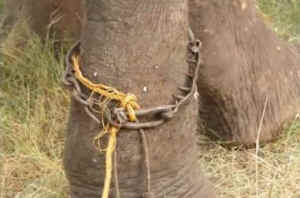 Raju’s captors layered tighter chains on him and attempted to confuse him by shouting commands, but their efforts proved futile. A team of 10 veterinarians and experts from Wildlife SOS along with 20 Forestry Commission officers and two policemen managed to rescue the abused elephant, according to the Mirror, a British tabloid. Sharp echoed Binepal’s statement while speaking with HuffPost. Raju was taken to the Elephant Conservation and Care Centre in Mathura. On July 4, the same day Americans celebrated their independence, Raju took his first steps of freedom. Sharp said he is doing “fabulously.” The Wildlife SOS team is prepared to help make Raju comfortable in his new life and to rehabilitate him by treating his physical wounds and introducing him to other elephants at the center. Elephants can live up to 70 years. Sharp says they hope Raju has another 10 years or more ahead of him. Visit Wildlife SOS to donate to Raju.